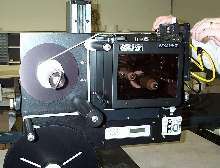 Model 250 prints and applies variable information labels using thermal transfer process. 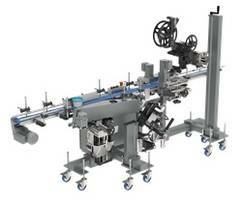 Semi-automatic system uses jig fixture to hold product in place during labeling process. Product and label sensors can be used to specify where label is to be applied with accuracy up to 1/8 in. Applicator is available with Sato, Zebra, or Datamax thermal transfer print engines and can print up to 12 ips with up to 300 dpi print resolution. ID Technology's engineering department has developed a label printer applicator to "flag" labels around wire, tubes and cables. The heart of this labeling system is an IDT Model 250 Label Printer Applicator, used to print and apply variable information labels using a thermal transfer process. 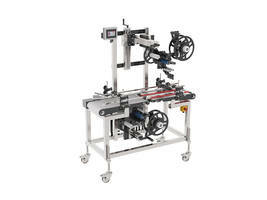 This semi-automatic system uses a jig fixture to hold the product in place during the labeling process. These Jigs can be customized for each application allowing for a range of product diameters to be labeled. 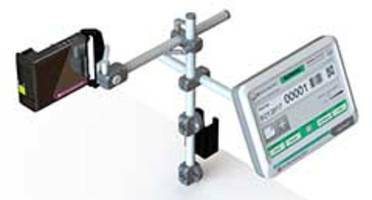 The applicator can be mounted to the floor, bringing the jig fixture to a comfortable table height position. 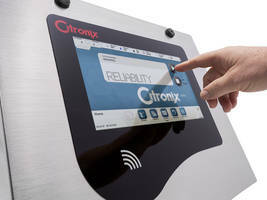 The printengine prints and dispenses a label onto a tamp pad. The printed label is then held in place on the pad until the operator triggers the applicator with a foot pedal. After the applicator receives the go signal, the tamp pad moves up to the product and closes the label around it, creating a "flag". Product and label sensors can be used to specify where the label is to be applied with accuracy up to 1/8". This applicator is available with Sato, Zebra or Datamax thermal transfer printengines and can print up to 12" per second and up to 300dpi print resolution. Barcodes, text and graphics print clearly on a large variety of label substrates. ID Technology is a national integrator of labeling, coding and marking systems, as well as, peripheral equipment, supplies and service.